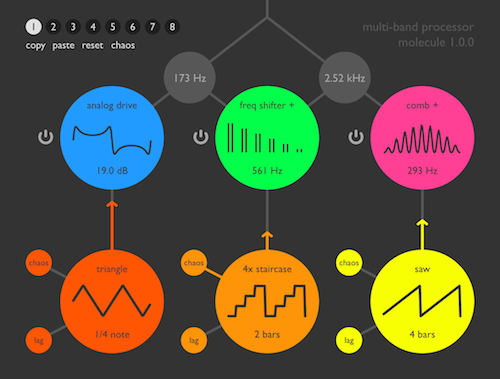 Molecule is a multi-band processor that allows you to split the sound into three frequency bands – low, mid, high – and pass them independently through different effects. It includes a vast array of algorithms such as comb filter, chorus ensemble, frequency shifter as well as barber-pole phaser, circuit-bent filter, digital- and analog-style distortion. Each of the three bands also gets its own tempo-synchronised modulator with multiple waveforms and realtime randomisation. Moreover, Molecule lets you store up to eight complete snapshots of itself and switch between them in realtime or via host automation. The graphic interface in Molecule uses a new design language with bold, colour-coded shapes that openly show all of the building blocks and their interconnections. With hardware-accelerated rendering and all-round parameter smoothing, it offers pleasant and intuitive operation. Altogether this makes Molecule a fun yet productive tool that goes as far as you want it to – from careful spicing-up to complete reconstruction. – Multiple minor optimisations to reduce processor load by approx. 10%. – Audio buffer is now being cleared when switching to comb filter or chorus ensemble. Molecule works with Logic, GarageBand, Live, MainStage, ReNoise, Reaper, Studio One, Digital Performer, Tracktion and other software that supports Audio Unit effect plugins. It comes in 32/64 bit format for Intel Macs running OS X 10.6 or later, and supports Retina screen resolution.